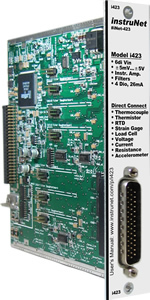 The following instruNet hardware provides digital input channels that can sense the on/off state of an external spst switch. 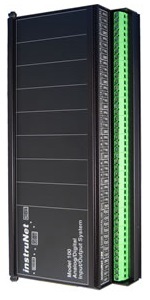 Each digital i/o channels contain an internal 2K to 4K ohm pull-up resistor (e.g. to 5Volts); therefore, attaching an external switch that shorts this node to 0V when closed will result in a logic 0 input when closed, and logic 1 input when open; as illustrated below. For information on avoiding contact bounce, please refer to the below discussion. When a switch toggles, it sometimes mechanically bounces between the on and off position, in a random manner, for < 30mSec. This is sometimes referred to as "contact bounce". If this multiple on and off during one toggle is a problem, then one might consider a "de-bouncing" circuit using a capacitor, as shown in the above illustration. 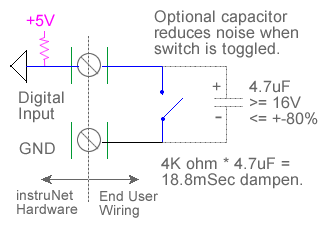 When the switch is closed, the capacitor discharges quickly (e.g. microseconds) to 0V through 0 ohms (switch is closed and can be thought of as 0 ohms). Then, when the switch is opened, the capacitor charges up slowly (approx 30mSec in the above example) to a logic 1 (e.g. up to 5 Volts via internal pull up resistor). Therefore, if it pulses closed for a short time right after opening, the digital input sees a constant logic 0 until the capactor is charged. And if it pulses open right after closing, the digital input sees a constant logic 0 up till the last close pulse. The i4xx digital and universal i/o channels include a hardware Schmitt trigger input circuit; however, the i100 and i200 do not. Schmitt Trigger means that the input will not fluctuate up and down while transitioning between a logic 0 and logic 1 voltage. For example, if the input voltage has 0.3Vrms of noise added to it, and it transitions from 0.5Volts and 2.5Volts slowly over a 1 second duration, the Schmitt trigger input will first see a 0, and then a 1; yet will not see intermediate pulses during the transition. In this example scenario, the behavior of NON-Schmitt trigger inputs is not defined (i.e. anything could be seen by digital input during a slow transition between a logic 0 and 1 voltage).